Question at the quiz: how tall is Big Bird off of Sesame Street? Aye - maybe on your big telly he is, pal - but in real life he's 8 foot 2. A geezer from the BBC quiz show Eggheads has been in touch, looking for contestants for the next series of the show. Attention quizmasters in the South West: Carloine is looking for a quizmaster for Thursday 12th November in a restaurant in Bath City Centre. And tell her the doc sent you. Contact Katie Lewis at The Boat - phone number is 01442 874056 and Katie says she's looking for a quizmaster who can bring in the crowds. 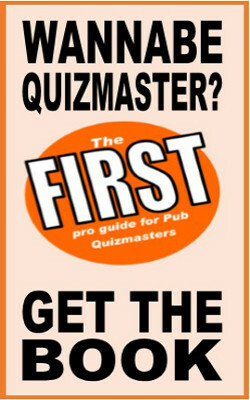 English Quiz company Quiz Quiz Quiz have created a quiz app for iphone which you can find at http://www.quizquizquiz.com/iphone/. You need an iphone or and ipod touch but David McGaughey from Quiz Quiz Quiz says they are planning to launch for other formats too. The Conservative Party has been desperately doing whatever they can to be more popular and it's working for them: they're favourites to be back in power next year for the first time since 1997. Read more: Elephant Knowledge Pwns Quiz!